Suppurative granulomatous inflammation is a common histopathological reaction pattern that is encountered in the tropical countries including India. It occurs usually due to infective etiology and identification of the causative pathogen is crucial to initiate appropriate treatment. In this review article, we discuss about certain common and uncommon condition which may present with this reaction pattern. 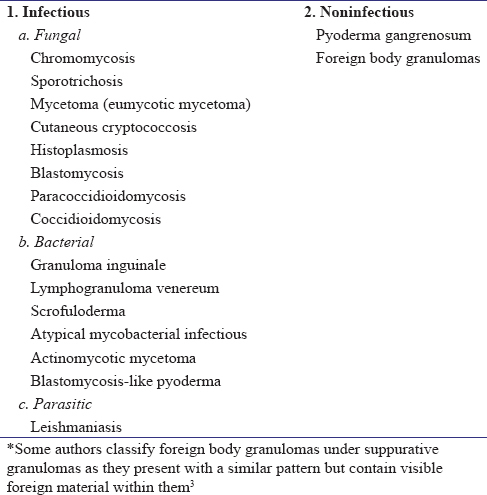 The suppurative (or “mixed cell”) granuloma is a common and important pattern of granulomatous inflammation, especially in the Indian context as it is seen in several tropical diseases. It is characterized by a collection of epithelioid histiocytes with scattered multinucleated giant cells with a central neutrophilic infiltrate. The various conditions where this pattern of inflammation can be seen are given in [Table 1]. The most common stain that is used in the diagnosis of suppurative granulomatous conditions is the periodic acid-Schiff's (PAS) stain that stains the cell walls of the fungi purple. Another such stain is the Grocott's stain which contains methenamine silver. This stains the fungi black against a green background. Although these stains are very useful, they may also stain several other structures other than the fungi creating a lot of artifact. These stains are very specific and stain only certain organisms, e.g., mucicarmine and Masson-Fontana stain for Cryptococcus. Although technically not a stain, this technique can help make a diagnosis when special stains are not available. There are certain fungi that exhibit autofluorescence when stained with H and E and viewed under ultraviolet light. Some common examples are Cryptococcus, candidial spores, and Aspergillus. Frozen sections of Cryptococcus can also be stained with calcofluor-blue and viewed under a fluorescent microscope. Understanding the pathogenesis and the differentiating features of the several diseases that present with this pattern of inflammation is of paramount importance. The characteristic features of the conditions discussed in this article are summarized in [Table 2]. Chromomycosis is a common tropical mycosis caused by dematiaceous fungi. It manifests as asymptomatic, slowly spreading verrucous plaques or nodules. The infection develops following minor trauma. The most commonly implicated organisms include Fonsecaea pedrosoi, Fonsecaea compacta, Phialophora verrucosa, Rhinocladiella aquaspera, and Cladosporium (Cladophialophora) carrionii. These organisms are saprophytes and can be found growing in decaying plant material. Standard diagnosis is based on the presence of Medlar bodies in the potassium hydroxide-cleared specimen obtained from skin scrapings or histopathologically. 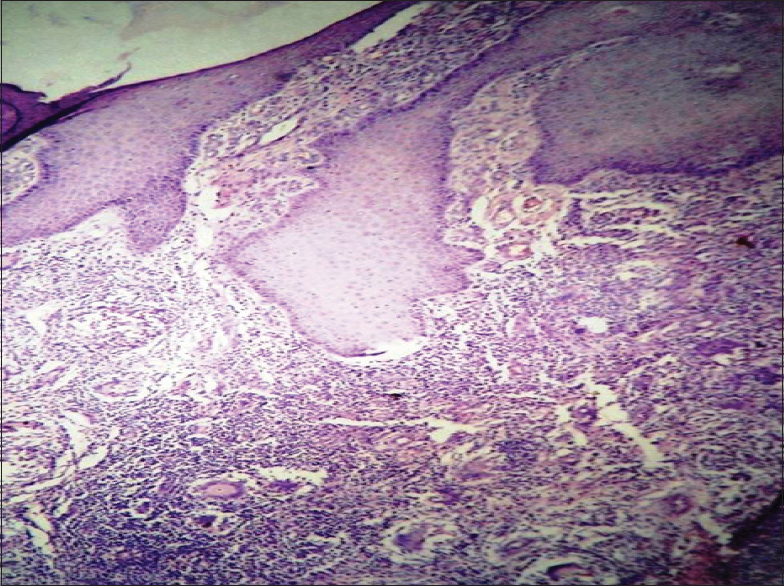 Histopathology shows hyperkeratosis, pseudoepitheliomatous hyperplasia [Figure 2], and a tuberculoid granulomatous inflammatory pattern in the upper and mid dermis. The dermal infiltrate consists of epithelioid histiocytes and multinucleated giant cells. Small neutrophilic abscesses may be present, but caseation is never observed. Fungi are seen as single or clustered thick-walled rounded golden-brown bodies within macrophages and lying freely in the dermis. These are known as sclerotic bodies, muriform cells, or Medlar bodies that are 5–12 μm in diameter [Figure 3] and [Figure 4]. The organisms are easily identified on H- and E-stained sections. Transepidermal elimination of the fungal spores may be clinically visualized as black dots on the surface of the lesion. Late lesions or treated, healing lesions are characterized by prominent dermal fibrosis. Sporotrichosis is caused by Sporothrix schenckii, a dimorphic fungus that is found in soil, decomposing material, on thorned plants such as roses, sphagnum moss, and animals. This organism exists as a filamentous fungus at room temperature and as pleomorphic yeast in tissue or at temperatures >37°C. It is commonly seen in the tropics. Infection follows minor trauma leading to inoculation. The sensitivity of histopathological identification is low because S. schenckii is normally absent or rarely found in smears or biopsies. The characteristic findings are the asteroid bodies and the Splendore-Hoppeli phenomenon which are described below. These, unfortunately, are neither sensitive nor specific for the histological diagnosis of sporotrichosis. The lesions of fixed cutaneous sporotrichosis demonstrate a central ulceration of epidermis surrounded by a hyperkeratotic edge with pseudoepitheliomatous hyperplasia. 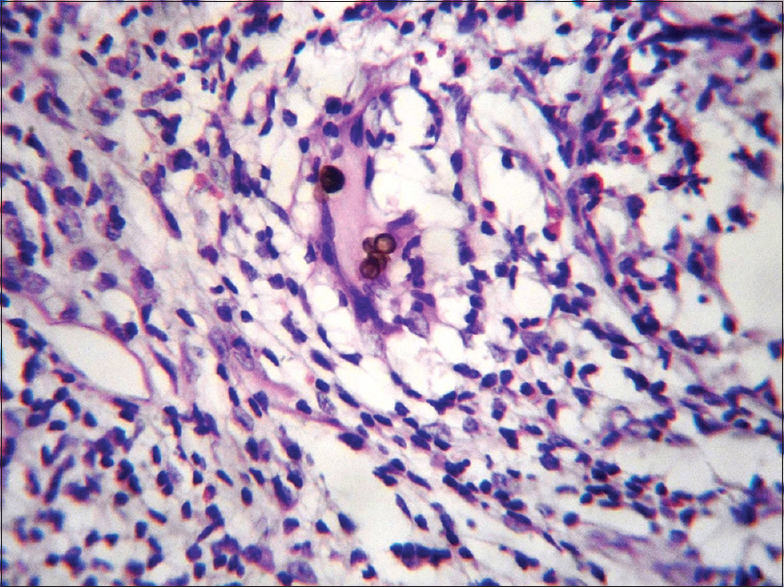 A mixed granulomatous infiltrate is seen in the upper and mid dermis. Neutrophilic abscesses may be seen. In lymphocutaneous sporotrichosis, three concentric zones may be identified: a central necrotic zone of chronic suppuration, a middle tuberculoid granulomatous zone composed of tuberculoid granulomas, and an outer syphiloid zone of plasma cells, lymphocytes, and fibroblasts with prominent capillary hyperplasia and proliferation. The fungal elements, when present, are seen as globose, budding yeast-like cells measuring 3–8 μm in diameter (in 84% cases), cigar-shaped cells sized 1–2 μm × 4–5 μm (in 33% cases), or oval to round or single budding forms of the yeast within the cytoplasm of giant cells or in the center of asteroid bodies. Asteroid bodies, sized 15–35 μm in diameter, are fungal cells surrounded by the Splendore-Hoeppli phenomenon, wherein the fungal elements are enveloped by an eosinophilic material radiating centrifugally in a “sunburst” pattern representing an immunologic reaction. This phenomenon is not specific to sporotrichosis and can be observed surrounding parasitic ova, actinomycotic granules [Figure 5], eumycotic granules, and foreign bodies. It may also be seen in other fungal infections, for example, Coccidioides immitis, Aspergillus, and Candida. Definitive diagnosis is made with culture to illustrate the characteristic appearance and dimorphic nature of the fungi. Another close differential is sporotrichosis in which microabscesses are more prominent. There is transepithelial elimination of fungal bodies and inflammatory debris. Dermal fibrosis is prominent in treated cases. Mycetoma is a chronic subcutaneous infection characterized by multiple abscesses and discharging sinuses that contain grains which are large aggregates of fungal or actinomycete filaments. It can be caused by about twenty different fungi and actinomycetes. Infections caused by fungi are called eumycetoma and by actinomycetes are actinomycetoma. Infection follows a penetrating skin injury., Actinomycetoma is more common than eumycetoma worldwide, and around 75% of mycetoma are actinomycotic in parts of India. Eumycetoma and actinomycetoma have similar clinical features except that actinomycetoma can spread more rapidly. Mycetoma begins as small, firm, painless subcutaneous plaques or nodules, usually at the site of injury. The most commonly affected site is the feet. Gradually, the lesions increase in number. The lesions ulcerate to discharge a seropurulent material with the characteristic grains [Table 3]. The infection tracks along the fascial planes and invades the deeper tissues associated with induration of the surrounding tissue associated with deformities. The condition is asymptomatic but may become painful when there is osseous involvement and secondary infection. 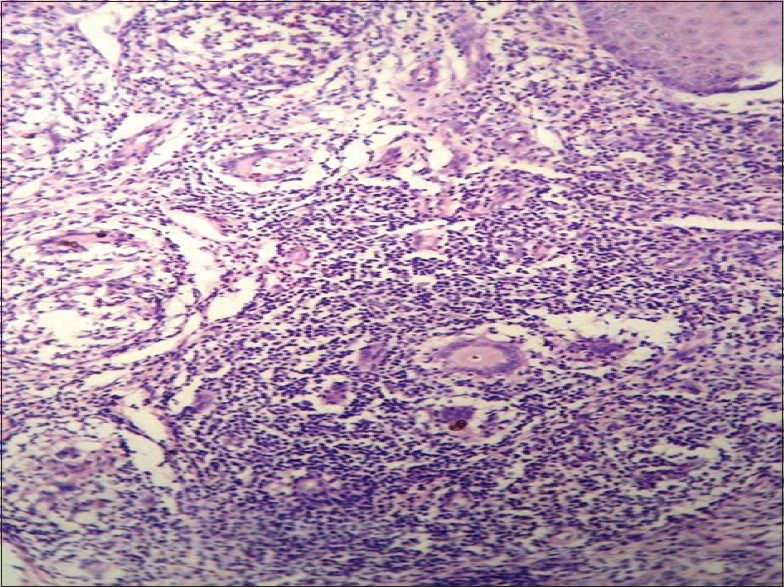 Histological examination of the affected skin shows extensive granulation tissue with abscesses that may lead to sinus formation. In the early stages of the disease, there is a lymphoplasmacytic infiltrate with histiocytes and a few fibroblasts. In the later stages of the disease, the fibroblasts predominate. In eumycetoma, the grains are surrounded by a narrow zone of polymorphs and further surrounded by a mixed inflammatory infiltrate consisting of mononuclear cells, histiocytes, and a few foreign body giant cells and occasional xanthomatous cells. In actinomycetoma, a wider zone of polymorphs and mixed inflammatory infiltrate with a few giant cells surround the grains. In most cases, the affected area shows fibrosis with lymph spaces within it. The granules of both eumycetoma and actinomycetoma stain with methenamine silver and PAS. Histopathological characteristics of grains of the common organisms are described. Under low power, the grains were large and uniformly brown, but under high power, they reveal an outer cortex and central medulla. The hyphae in the cortex show an almost regular radiating pattern; the grains may be filamentous or vesicular in nature. The brown pigment is more prominent at the periphery. The grains in this species are also large with a dark brown peripheral zone made up of multiple vesicles immersed in cement material. Toward the center, vesicles are less apparent and filamentous hyphae are more prominent, but very lightly pigmented. The grains in these species are large, but cement is absent. They are eosinophilic with a deeper color at the periphery. The grains are large, rounded, kidney-shaped, and multilobed in a few cases. They are basophilic, but mildly eosinophilic at the periphery, and have a homogeneous appearance with cracks in places and radiating filaments at the margins. The grains are small, rounded or oval, appear pale blue with H and E stain, and are surrounded by an eosinophilic band. Definitive diagnosis is made by visualization of grains. Culture on Sabouraud's dextrose agar polymerase chain reaction and  ribosomal DNA detection are also used in the diagnosis of mycetoma. Evidence of later bone involvement, such as periosteal thickening, bone lytic lesions, and increased bone density, can also be seen radiologically. The differential diagnosis of mycetoma includes actinomycosis, botryomycosis and osteomyelitis, chromoblastomycosis, and scrofuloderma. It can be differentiated by the presence of the characteristic grains. Cutaneous leishmaniasis (CL) is one of the most common forms of leishmaniasis worldwide. The disease is a protozoan infection caused by various species of the genus leishmania, which is transmitted by transmitted by the bite of an infected sandfly. With its myriad presentations, it poses considerable difficulty in diagnosis. Familiarity with clinical features and histopathology findings enable one to suspect the condition which can be confirmed by doing newer investigations. In places where the disease is not endemic, this is all the more important. Diagnosis of leishmaniasis can be made by doing a slit and scrape smear of lesion, which will show Leishman-Donovan (LD) bodies, the amastigote form of the protozoan within macrophages and histiocytes [Figure 7]. Biopsy from an early lesion shows an atrophic epidermis and dense infiltrate in the dermis composed of macrophages, histiocytes' few epithelioid cells, and good number of lymphocytes. This stage where suppurative granulomas can be seen. Many of the macrophages would be seen to harbor the LD bodies which have a tendency to orient toward the periphery of the cytoplasm, referred to as “Marquee sign.” LD bodies are visible in hemotoxylin and eosin sections but can be highlighted by Giemsa stain. In the older lesions, there is gross epidermal hyperplasia, occasionally, to the extent of pseudoepitheliomatous hyperplasia. Well-developed noncaseating tuberculoid granulomas develop with both Langhan's as well as foreign body type giant cells. There is very little chance of identifying LD bodies at this stage. Down in the deep dermis, granulomas may orient around nerve bundles. Scrofuloderma (SD) (also known as tuberculosis cutis colliquativa) is a type of cutaneous tuberculosis that results from direct extension from an underlying tuberculosis focus in lymph nodes and bones to the overlying skin. It begins as a painless subcutaneous nodule, which subsequently suppurates (“cold abscesses”). It then breaks down to form an irregular, superficial ulcer with undermined cyanotic edges. Sometimes, sinuses may develop between deep foci of the infection. Ulcers heal with retracted, cordlike, irregular scars. The most commonly affected areas are the neck, armpits, chest wall, and groin. 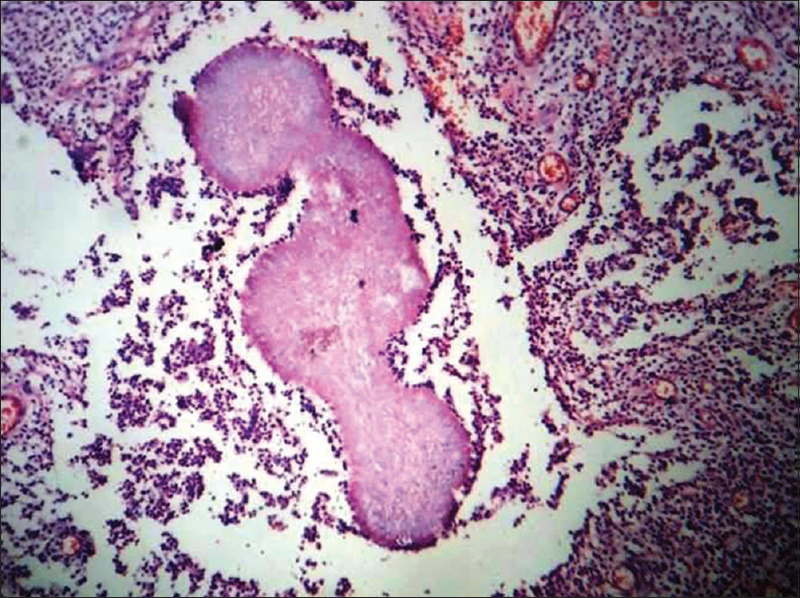 Histologically, SD is characterized by a dermal abscess (accumulation of neutrophils) with pronounced caseating necrosis underneath an ulceration., There are macrophages, lymphocytes, and plenty of acid-fast rods (Ziehl–Neelsen stain). Tuberculoid granulomas may be seen in the deeper portions or at the lateral borders of the abscess. Besides M. marinum infection, suppurative granuloma may also occur with other atypical Mycobacterium infections such as Mycobacterium fortuitum. It is a rapidly growing Mycobacterium in soil and water. It has been reported to cause infections of postsurgical wounds, soft tissue, skin, and lung. Disseminated disease has been reported in immunocompromised patients. Cryptococcosis is caused by four serotypes (A–D) of Cryptococcus neoformans. Immunosuppressed individuals are more commonly affected. The spores are 4–12 μm in size and form a mucous capsule. Cutaneous cryptococcosis (CC) may be either primary or secondary. The former is a result of direct inoculation after an injury and may be seen in healthy individuals. It is characterized by a single nodule, ulcer, cellulitis, panniculitis, or abscess. Secondary CC is the result of hematogenous spread from pulmonary infection and is usually seen in immunocompromised patients. It presents with multiple erythematous or skin-colored, umbilicated, papulonodular lesions on the face and neck, mimicking molluscum contagiosum. These lesions are often the first presenting symptom of the fatal systemic disease; therefore, recognition of them is crucial to start an early treatment. Two types of histopathological reactions have been described irrespective of the type of skin lesions in CC – gelatinous and granulomatous. Gelatinous reactions show very subtle inflammation but abundant organism. Latter, on the other hand, is characterized by suppurative granulomatous inflammation with scant organism. Special stains are often required to demonstrate the fungus; these include mucicarmine, PAS, Alcian blue, and methenamine silver. Mucicarmine positivity may help to differentiate CC from other fungal infection such as histoplasmosis and blastomycosis which might share clinical features. Blastomycosis is caused by Blastomyces dermatitidis. Although initially thought to be confined to North American, it has been reported from around the world including India. The infection is acquired through the respiratory route and presents in three forms – pulmonary, disseminated, and primary cutaneous blastomycosis. Disseminated cutaneous blastomycosis starts as papulopustules that progress to form either verrucous or ulcerated plaques. As the disease progress peripherally, the center of the lesions may heal with atrophy and scarring. The face, neck, and limbs are commonly involved in disseminated cutaneous blastomycosis. Primary cutaneous blastomycosis is extremely rare and follows inoculation of the organism as a solitary, nodule, or ulcer. Lymphangitis and painful lymphadenopathy may accompany them. Biopsy from the active border will often show neutrophilic abscess in the dermis. Subsequently, granulomatous reaction develops with plenty of multinucleated giant cells and epithelioid cells; occasionally, this may result in tuberculoid granuloma. The fungal spores can be seen within the giant cells as well as free in the connective tissue. Use of fungal stains facilitates their visualization. The epidermis is acanthotic and may show pseudoepitheliomatous hyperplasia. Mucicarmine staining will help to distinguish it from CC; histoplasmosis often shows narrow-necked budding forms in contrast to blastomycosis which shows broader-based buds. Paracoccidioidomycosis is caused by Paracoccidioides brasiliensis. It typically affects the skin around the mouth, as a result of direct extension from the so-called muriform or mulberry-like stomatitis. The lips may be diffusely swollen or a plaque may be seen. Rarely, multiple skin lesions may develop following hematogenous dissemination. They may present as erythematous papular, papulopustular, ulcers covered with fine hemorrhagic dots. Lymphadenopathy may accompany perioral or disseminated skin lesions. Multiple enlarged lymph nodes may be seen in the cervical and submandibular regions. 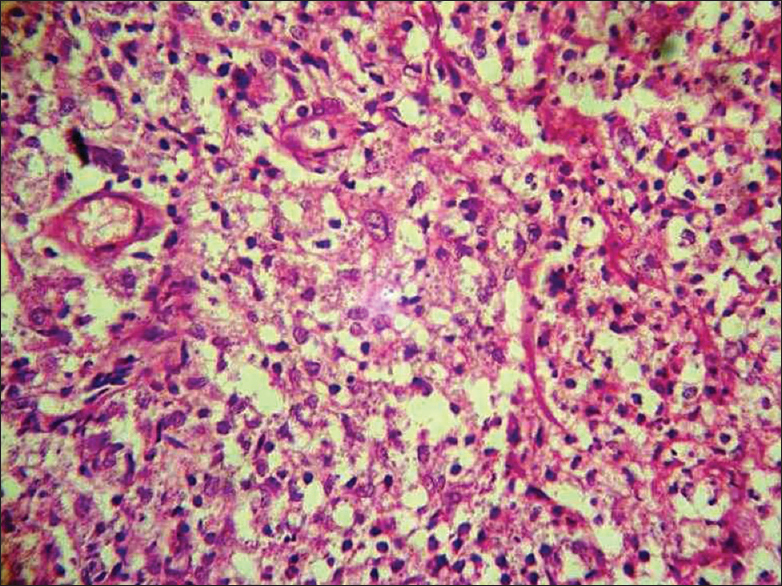 Histologic picture resembles that of blastomycosis. The spores of P. brasiliensis resemble marine “pilot wheel” with protrusion of peripheral buds from the spores and said to be diagnostic of this condition. It is caused by a dimorphic fungus, C. immitis; cutaneous lesions are uncommon and almost always due to dissemination. They appear as verrucous papules, nodules, and plaques. There may be subcutaneous abscesses which breaks open to form sinus tracts. Histological pictures are similar to other infections mentioned above. The spores of C. immitis are larger and are round, thick walled, and have a granular cytoplasm. Donovanosis is caused by Klebsiella granulomatis, Gram-negative bacilli. It is characterized by an ulcerating lesion in the genital or perianal region. The ulcers are typically covered with exuberant granulation tissue which gives them a “beefy red” appearance. Affected individual may have multiple, usually painless ulcers which bleeds easily on manipulation. This condition is predominantly found in tropical regions. Histologically, there is an abundance of plasma cells and macrophages in the dermis; small neutrophilic abscess is scattered throughout the dermis. The pathognomonic feature of donovanosis is the demonstration of vacuolated macrophages. The vacuolation occurs because of the presence of bacteria which exhibit telephone handle appearance due to bipolar condensation of the chromatin when stained with Wright or Giemsa stain and are found in up to 80% of all cases. The epidermis often exhibits pseudoepitheliomatous hyperplasia. Lymphogranuloma venereum is caused by Chlamydia trachomatis (serovars L1, L2, L3). It is predominantly found in tropical regions; it is characterized by a self-healing genital ulcer. Subsequently, the organism colonizes the lymphatic system, vessels, and lymph nodes, leading to inguinal lymphadenitis. Initial histopathological features are nonspecific. The lymph nodes show stellate neutrophilic abscess surrounded by palisading granulomatous reaction. The pathogen can be identified using antibodies directed against C. trachomatis. Weedon D. The granulomatous reaction pattern. In: Skin Pathology. 4th ed. New York: Churchill Livingstone; 2016. p. 720-3. Dhar S. Histopathological features of granulomatous skin diseases: An analysis of 22 skin biopsies. Indian J Dermatol 2002;47:88-90. Mutasim DF. Suppurative granuloma. In: Practical Skin Pathology. 1st ed. Switzerland: Springer International Publishing; 2015. p. 36. James WD, Berger TG, Elston DM, editors. Diseases resulting from Fungi and Yeasts. In: Andrew's Diseases of the skin Clinical Dermatology. 10th ed. Canada: Saunders Elsevier; 2006. p. 323. 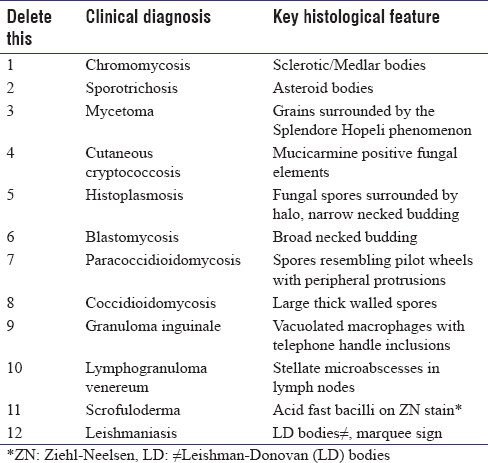 McGinnis MR. Chromoblastomycosis and phaeohyphomycosis: New concepts, diagnosis, and mycology. J Am Acad Dermatol 1983;8:1-6. Londero AT, Ramos CD. Chromomycosis: A clinical and mycological study of thirty-five cases observed in the hinterland of Rio Grande du Sul, Brazil. Am J Trop Med Wyg 1976;25:132-5. Simson FW. Chromoblastomycosis; some observations on the types of the disease in South Africa. Mycologia 1946;38:432-49. Rippon JW. Chromoblastomycosis. In: Wonsiewicz M, editor. 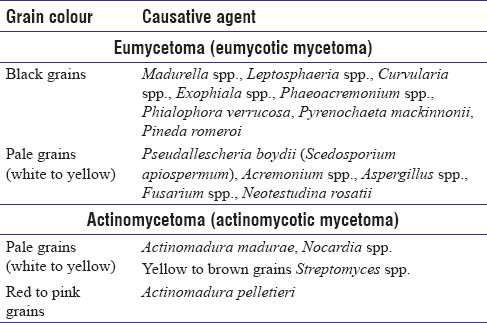 Medical Mycology the Pathogenic Fungi and Pathogenic Actinomycetes. 3rd ed. Philadelphia: W.B. Saunders Company; 1988. p. 276-96. Diaz A, Pascal J, Monnin L, Bousquet C, Amat C, Michault A, et al. Cerebral chromoblastomycosis. Apropos of a case. Review of the literature. Neurochirurgie 1996;42:95-9. Hinshaw M, Longley BJ. Fungal diseases. In: Elder D, Elenitsas R, Johnson B, Murphy GF, Xu X, editors. Lever's Histopathology of the Skin. 10th ed. Philadelphia: Lippincott Williams and Wilkins; 2009. p. 591-620. De A, Gharami RC, Datta PK. Verrucous plaque on the face: What is your diagnosis? Dermatol Online J 2010;16:6. Queiroz-Telles F, Esterre P, Perez-Blanco M, Vitale RG, Salgado CG, Bonifaz A, et al. Chromoblastomycosis: An overview of clinical manifestations, diagnosis and treatment. Med Mycol 2009;47:3-15. Castro LG, de Andrade TS. Chromoblastomycosis: Still a therapeutic challenge. Expert Rev Dermatol 2010;5:433-44. Gastineau FM, Spolyar LW, Haynes JE. 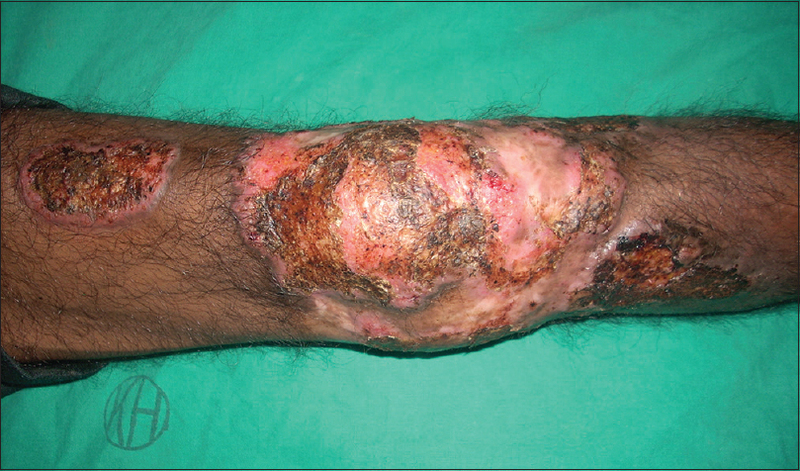 Sporotrichosis: Report of six cases among florists. Am Med Assoc 1941;117:1074-7. Gonηalves AP. Sporotrichosis. In: Canizare O, Harman R, editors. Clinical Tropical Dermatology. 2nd ed. Massachusetts, USA: Blackwell Scientific Publications; 1992. p. 88-93. Mahajan VK, Sharma NL, Shanker V, Gupta P, Mardi K. Cutaneous sporotrichosis: Unusual clinical presentations. Indian J Dermatol Venereol Leprol 2010;76:276-80. Rafal ES, Rasmussen JE. An unusual presentation of fixed cutaneous sporotrichosis: A case report and review of the literature. J Am Acad Dermatol 1991;25:928-32. Duran RJ, Coventry MB, Weed LA, Kierland RR. Sporotrichosis; a report of twenty-three cases in the upper extremity. J Bone Joint Surg Am 1957;39-A: 1330-42. Silva-Vergara ML, Maneira FR, De Oliveira RM, Santos CT, Etchebehere RM, Adad SJ, et al. Multifocal sporotrichosis with meningeal involvement in a patient with AIDS. Med Mycol 2005;43:187-90. Freitas DF, de Siqueira Hoagland B, do Valle AC, Fraga BB, de Barros MB, de Oliveira Schubach A, et al. Sporotrichosis in HIV-infected patients: Report of 21 cases of endemic sporotrichosis in Rio de Janeiro, Brazil. Med Mycol 2012;50:170-8. Hirsh BC, Johnson WC. Pathology of granulomatous diseases. Mixed inflammatory granulomas. Int J Dermatol 1984;23:585-97. Rodríguez G, Sarmiento L. The asteroid bodies of sporotrichosis. Am J Dermatopathol 1998;20:246-9. Palestine RF, Rogers RS 3rd. Diagnosis and treatment of mycetoma. J Am Acad Dermatol 1982;6:107-11. Ahmed AO, Mukhtar MM, Kools-Sijmons M, Fahal AH, de Hoog S, van den Ende BG, et al. Development of a species-specific PCR-restriction fragment length polymorphism analysis procedure for identification of Madurella mycetomatis. J Clin Microbiol 1999;37:3175-8. Sharma JC, Joshi KR, Vyas MC, Sankhla SS, Gupta SP. A clinicopathological and mycological study of mycetoma involving upper extremity at Jodhpur, India. Indian J Med Sci 1988;42:103-8. Gammel JA. The etiology of maduromycosis with a mycologic report on two new species observed in the United States. Arch Derm Syph 1927;15:241-84. Ramam M, Bhat R, Garg T, Sharma VK, Ray R, Singh MK, et al. Amodified two-step treatment for actinomycetoma. Indian J Dermatol Venereol Leprol 2007;73:235-9. McGinnis MR. Mycetoma. Dermatol Clin 1996;14:97-104. Lichon V, Khachemoune A. Mycetoma: A review. Am J Clin Dermatol 2006;7:315-21. Khatri ML, Al-Halali HM, Fouad Khalid M, Saif SA, Vyas MC. Mycetoma in Yemen: Clinicoepidemiologic and histopathologic study. Int J Dermatol 2002;41:586-93. Alvar J, Vélez ID, Bern C, Herrero M, Desjeux P, Cano J, et al. Leishmaniasis worldwide and global estimates of its incidence. PLoS One 2012;7:e35671. Kumar NP, Srinivasan R, Anish TS, Nandakumar G, Jambulingam P. Cutaneous leishmaniasis caused by Leishmania donovani in the tribal population of the Agasthyamala Biosphere reserve forest, Western Ghats, Kerala, India. J Med Microbiol 2015;64:157-63. Kumar R, Bumb RA, Ansari NA, Mehta RD, Salotra P. Cutaneous leishmaniasis caused by Leishmania tropica in Bikaner, India: Parasite identification and characterization using molecular and immunologic tools. Am J Trop Med Hyg 2007;76:896-901. Sharma NL, Mahajan VK, Kanga A, Sood A, Katoch VM, Mauricio I, et al. Localized cutaneous leishmaniasis due to Leishmania donovani and Leishmania tropica: Preliminary findings of the study of 161 new cases from a new endemic focus in Himachal Pradesh, India. Am J Trop Med Hyg 2005;72:819-24. Simi SM, Anish TS, Jyothi R, Vijayakumar K, Philip RR, Paul N, et al. Searching for cutaneous leishmaniasis in tribals from Kerala, India. J Glob Infect Dis 2010;2:95-100. Scollard DM, Dacso MM, Abad-Venida ML. Tuberculosis and leprosy: Classical granulomatous diseases in the twenty- first century. Dermatol Clin 2015;33:541-62. Mitteldorf C, Tronnier M. Histologic features of granulomatous skin diseases. Part 2: Infectious granulomatous disorders. J Dtsch Dermatol Ges 2016;14:378-88. Abbas O, Marrouch N, Kattar MM, Zeynoun S, Kibbi AG, Rached RA, et al. Cutaneous non-tuberculous mycobacterial infections: A clinical and histopathological study of 17 cases from Lebanon. J Eur Acad Dermatol Venereol 2011;25:33-42. Smith MB, Schnadig VJ, Boyars MC, Woods GL. Clinical and pathologic features of Mycobacterium fortuitum infections. An emerging pathogen in patients with AIDS. Am J Clin Pathol 2001;116:225-32. Grayson W. Infectious diseases of the skin. In: Calonje E, Brenn T, Lazar A, McKee PH, editors. In: Mckee's Pathology of the Skin. 4th ed. London: Elsevier; 2012. p. 760-895. Günaştı S, Aksungur VL. Granulomatous disorders. Clin Dermatol 2014;32:47-65.